Jafar Kiani was an anonymous Iranian prisoner until earlier in the month he became the first Iranian to be stoned to death since 2002. Iran's decision to revert to domestic barbarism is just one aspect of the regime's strategy for terrorizing its people sufficiently to quell all pockets of resistance to its rule. The regime's determination to prevent an internal rebellion is an integral part of its larger plan to cast aside all obstacles to its acquisition of nuclear weapons. Iran already possesses what it needs to make nuclear bombs. What it needs is time. Last summer's war against Israel was timed to provide Iran with a respite from international pressure. Hizbullah's abduction of IDF reservists Eldad Regev and Ehud Goldwasser took place the day before the leaders of the G-8 were scheduled to discuss Iran's nuclear program. 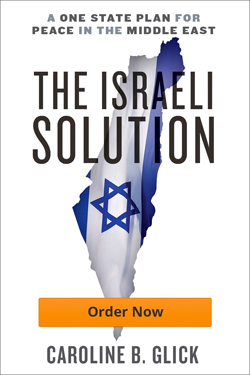 By ordering the assault on Israel, Iran diverted their attention away from its nuclear program. Ever since the war, the Olmert government has declared that the war split the Muslim world into two camps – the moderates and the extremists. Operating on the basis of this perceived split, Israel has sought to build a coalition with the moderates in the hopes that such a coalition will block Iran from acquiring the bomb. A year after the war, the time has come to make a renewed assessment of the situation. Are moderates blocking Iran from acquiring nuclear weapons? If not, what has transpired? A good place to start the analysis is with an item that appeared on both Prime Minister Ehud Olmert's and Iranian President Mahmoud Ahmadinejad's to-do list this week. Both leaders telephoned Turkish Prime Minister Recip Erdogan to congratulate him on his Islamist AKP party's electoral victory on Sunday. Turkey is perceived as the paragon of Muslim moderation. Olmert, Foreign Minister Tzipi Livni and President Shimon Peres have all stated that Israel does not have a problem with AKP's Islamist character. Indeed, in a bow towards Turkish friendship, Olmert revealed last week that Turkey has been facilitating talks between Israel and Syria towards an Israeli surrender of the Golan Heights. Yet Ankara's readiness to encourage Israel to hand the Golan Heights over to Iran's client state does not necessarily indicate that Turkey is Israel's friend. Indeed, since the AKP rose to power in 2002, it has distanced Turkey from both Israel and the US while warming Turkish relations with Iran and Syria. Starting with Turkey's refusal to participate in or support the US-led overthrow of Saddam Hussein's regime, recent years have been marked by steadily increasing Turkish hostility. Two weeks ago, to Washington's dismay, Turkey signed a $3.5 billion gas deal with Iran. As to Israel, Erdogan was the first leader to host Hamas terror masters after the jihadist movement won the Palestinian elections in January 2006. During last summer's war, Iran shipped arms to Hizbullah through Turkey. Turkey's leaders have repeatedly declared their support for Iran's right to develop its nuclear program. IRAN'S COURTSHIP of Turkey is but one aspect of its foreign policy. Over the past several years, Iran has built webs of alliances with other states, alliances that have significantly deepened since last summer's war. In the first circle, Iran has its clients – Syria, Hizbullah, the Shiite (and increasingly the Sunni) militias in Iraq, and the Palestinians. Just as these forces fought together last summer, so they will fight together in the future. Ahmadinejad's visit to Damascus last weekend was strikingly similar to meetings he held with his terror underlings before last summer's war. In its second circle, Iran has cultivated strategic ties with countries in Latin America, which, led by Venezuela, share its hatred for America. These ties serve three purposes. First, they provide Iran with a global deterrent against the US. Second, they provide Iran with ready support in diplomatic forums. Third, they build support for Iran among the "progressive" set in the US and Europe. In Iran's third circle of alliances are countries like Russia, China and Egypt. While all these states publicly oppose Iran's acquisition of nuclear weapons, they effectively block the international community from taking effective action against Iran's nuclear program. In the meantime, Israel's coalition of moderates has failed to materialize. The leaders of the sought-for coalition, Saudi Arabia and Egypt, refuse to take any action against Iran. Indeed, they effectively support Teheran. In February, Saudi King Abdullah feted Ahmadinejad during a state visit. The next month, by mediating the formation of the Hamas-Fatah government, Abdullah enabled Iran's Palestinian proxy to gain control of the Palestinian Authority. As for Egypt, it is using Iran's nuclear program as cover to advance its own nuclear weapons program. Then there are the great powers and foremost among them Russia, France and the US. Any UN action against Iran must be agreed upon by all three. And there is little chance of that ever happening. Russia is Iran's ally. Russia supplied Hizbullah and Syria with arms and intelligence during last summer's war. In the intervening year, Russia has sold advanced weapons systems to both Iran and Syria. Last weekend's report in the Arab media regarding Iranian financing of Syrian purchases of Russian jet fighters, tanks and missiles is part of this overall picture. Israeli analysts scoffed at the report, noting that the billion dollars Ahmadinejad pledged is insufficient to purchase the weapons he outlined. But those weapons will not all be going to Syria. Last April Iran and Syria signed an agreement essentially merging their militaries. Iran's Defense Minister Mustafa Muhammad Najjar told reporters in Damascus, "We consider the capability of the Syrian defensive forces as our own." He added that Iran "offers all of its defense capabilities to Syria." While Russia is selling the weapons to Syria, a Russian military official said of the aircraft, "The Syrians will be getting the top line of Russian aircraft through financing by Iran and [will] share some or most of the platforms with the Iranian air force." Jane's Defense Monthly reported that at least 10 of the artillery-missile systems will also be transferred to Iran. Russia also acts as Teheran's diplomatic shill. During a summit in Teheran last month Russian Foreign Minister Sergei Lavrov said, "We do not see any kind of threat from Iran." In a subsequent visit to Israel, Lavrov insisted that Russia's arms sales pose no threat to the Jewish state, and anyway, the only way for Israel to ensure its security is to surrender the Golan Heights to Syria. But the Olmert government refuses to acknowledge that Russia has reinstated its Cold War hostility towards Israel. It vapidly praises President Vladimir Putin for his "positive role" in the region and continues to adhere to the line that Russia will agree to UN Security Council action against Iran. Then there is France. Last summer France displayed open hostility towards Israel in its representation of the Lebanese government in which Hizbullah was then a member at the UN ceasefire talks. On the other hand, in 2005 France joined forces with the US to expel the Syrian military from Lebanon after the assassination of former Lebanese prime minister Rafik Hariri. with Lebanese factions outside of Paris this month. Additionally, early this month France led 10 EU member states in meddling in the Palestinian-Israeli conflict. The foreign ministers of these largely Mediterranean EU member states sent a letter to Quartet envoy Tony Blair, demanding, among other things, that Israel agree to the deployment of international forces in Judea and Samaria, and that Hamas be invited to participate in an international conference on the issue. As France treats with Iran on Lebanon, the US follows a similar course of engaging the mullahs on Iraq. After his meeting with his Iranian counterpart in Baghdad this week, US Ambassador Ryan Crocker announced the formation of a joint US-Iranian security committee which will discuss Sunni terrorism in Iraq. Apparently in the interest of advancing America's "security cooperation" with Iran, the State Department refused to raise the issue of the five American citizens being held hostage in Iran at the meeting. And with the prospect of diplomatic "progress" with Iran on Iraq in the air, the US certainly doesn't want to rock the boat by pursuing the issue of Iran's nuclear weapons program. Indeed, Iran's carrot and stick approach to powers like the US and France form a fourth circle of ties. Iran has worked to neutralize threats from these countries by attacking their interests in other spheres: Lebanon, in the case of France, and Iraq, in the case of the US. Given both countries' enthusiasm for "engagement," it seems that the mullahs have hit on the right approach. ISRAEL HAS experienced some achievements regarding Iran over the past year. The UN Security Council did pass two sanctions resolutions against Iran. With the active lobbying of opposition leader Binyamin Netanyahu, many US public employee pension funds are moving to divest from companies that do business with Iran. And this week, British Prime Minister Gordon Brown announced that like his predecessor Tony Blair, he will not rule out the option of using military force to prevent Iran from acquiring nuclear weapons. Yet despite these achievements, Iran has made steady progress with its nuclear program. Wednesday Ahmadinejad announced, "Iran will never abandon its peaceful [nuclear] work." Sunday, a senior Iranian official told The Independent that with almost 3,000 centrifuges operating at its nuclear facility at Natanz, "We have at the moment enough centrifuges to go to a bomb." Back in Israel, this week Olmert made clear that he wishes to advance contacts with the Palestinians towards an Israeli withdrawal from Judea and Samaria. His advisors told reporters that Olmert is moved by his desire to get beyond his failure in last year's war and the criminal investigations into his shady business dealings. He wishes to be perceived as a statesman. Of course if Olmert truly wishes to be seen as a statesman, then he shouldn't be concerning himself with Israeli withdrawals that will only strengthen Iran. He should change his strategic focus to Iran which threatens to wipe Israel off the map. Despite his government's protestations to the contrary, there is no coalition of moderates to work with against Iran. There is no coalition at all. And time is not working in Israel's favor. If Olmert wishes to gain the public's support, and even admiration, he must quickly build and deploy a military option for destroying Iran's burgeoning ability to destroy the State of Israel.